I have searched all the other parishes in the Skipton Registration District which had Rileys in the 1841 census. The majority of these are in Kildwick, a village 4 miles south of Skipton. It was there that I found the only baptism for William Riley where the birth date matches William’s age in 1851. 1814 bapt July 10th born June 17th William son of Thomas and Elizabeth Riley. Glusburn. Weaver. William’s mother was Elizabeth Clapham of Glusburn. I have found no evidence that this child died young or married someone other than Ann Harrison. William was an only child. The only problem with this identification is that successive censuses for Kildwick show a William Riley, worsted weaver, born in Glusburn. The ages do not quite match the 1814 baptism, but I have been unable to find an alternative baptism for him. If we have the right William, then his father is likely to have woven by hand – the sort of craftsman who was being put out of work by the Industrial Revolution. William went to work in a cotton mill in Skipton. The Industrial Revolution had reached Skipton in 1785, when High Mill was built for the spinning of cotton. The town boomed during the Industrial Revolution. This was greatly helped by the fact that it lay on the Leeds-Liverpool Canal, connecting these two major cities. More mills sprang up in Skipton. By the time of the 1841 census, Belle Vue and Low Mill had been added to High Mill. These two were for weaving as well as spinning. Belle Vue was built in 1828 and Low Mill in 1839. William is likely to have worked at one of these three. ANN HARRISON was also born in Skipton. Her age in the 1851 census shows her to be the daughter of Edward Harrison and Elizabeth Barker, christened on 4 July 1813 in Skipton in Craven. 1813 bapt 4th July born 10th April Ann Daughter of Edward and Elizabeth Harrison Skipton Cotton Spinner. She was the oldest child in a family of five. A younger brother died in infancy. By 1841 her younger sister Mary was a worker in a cotton mill, and it is likely that this was Ann’s occupation before her marriage. Although her father worked in a cotton mill, Ann’s grandfathers were a yeoman farmer and a blacksmith. 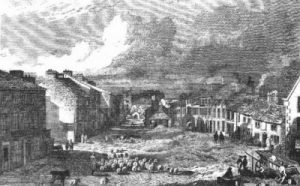 Despite its growing industrialisation, Skipton in the 1830s still had something of the air of a rural market town. William Riley Labourer and Bachelor married Ann Harrison Spinster in Skipton, on 30 March 1834. Both groom and bride made their mark. They had six children baptised in Skipton between 1834 and 1845, the end of William IV’s reign and the beginning of Queen Victoria’s. As was quite common at that time, their first child, John, was conceived before the marriage. The details in the Skipton baptism register allow us to chart William’s progress in the cotton mill. 1834 John was christened on 2 November. In1841 they were living at Back of Becks in the centre of Skipton. With them was also 19-year-old Mary Harrison, Ann’s sister, whose age has been rounded down to 15. Both their parents had died by then. Like William, Mary was working in a cotton mill. William and Ann’s ages have also been rounded down to 25. Their true ages were 27. William had risen from labourer at the time of his wedding to a responsible position as an overlooker. In 1841 there were only 13 Rileys in Skipton. William’s family accounted for 6 of these. Anthony and Kzia Riley added another 4 names. James and Mary Riley had no children. All were of William’s generation or younger, with the exception of Nancy Riley, aged 85. This reinforces the perception that the Rileys did not originate in Skipton. William was in employment, but that does not mean that things were going well for the family. Writing his History of Skipton in 1882, W. H. Dawson tells us:It is impossible to pass over the labour disturbances which extended over a great portion of Yorkshire and Lancashire in the summer of 1842, The town of Skipton was affected in this way only — that it was, on the 16th of August, invaded by a Lancashire mob of some 3,000 persons, who stopped the mills, and put the inhabitants into a state of terror from which it took them several days to recover. The time was one of great national trade depression. Many causes assisted to produce it. Textile operatives attributed it to the substitution of power for hand-worked machinery. By some political economists it was traced to “the increased capital applied to manufacturing purposes”; by others to the state of the currency. Another factor in the distress which prevailed amongst the working classes was the restriction then placed upon the import of corn. To give work to the multitude of unemployed inhabitants, public works, such as the construction of roads, were undertaken. It was so in our own locality. Unfortunately, the textile operatives of East Lancashire did not bear their troubles with the fortitude that characterised their near Yorkshire neighbours. Perhaps it was that they suffered in a greater degree. However that may have been, they declared that man was ” born to live and not to clem (starve),” and that as they had nothing of their own on which to prolong 0existence, they should apply to, and if necessary extract from, those in the enjoyment of plenty. It was at the beginning of the third week in August that a foraging expedition started eastward from the neighbourhood of Colne and Burnley. Their mission was threefold. They intended to demand food all along the route, to put a stop to steam-power employment — to which in a great measure they attributed their troubles — and, by inviting operatives everywhere to join them, to form a movement so gigantic that their demands should not be withstood. The men were armed with heavy clubs, and walked four abreast. Their staves were carried horizontally, each man having hold of two sticks by the ends ; the idea being probably that by marching thus their ranks would with difficulty be disordered in the event of attack. The leaders wore round the arm a strip of white cloth or tape. The rioters obtained the name “plug- drawers ” because it was their plan to draw the plugs from the boilers of all the factories they visited, and thus put an end to work. At that time ” waggon boilers ” were generally used, the fire being underneath the boiler and not in a flue through it, as is usual now. An iron plug was inserted in the bottom of the boiler, and this knocked out, the water of course escaped. Like a ball of snow the mob increased at every step. The fame of the rioters preceded them to Skipton, and when on the morning of Tuesday, the 16th August, it became known that this town was to be visited the good folk were thrown into a state of profound alarm. They arrived in the afternoon, to the number of 3,000 persons, including men, women, and children. They came by Broughton, and were met at a short distance from the town by Mr. T. H. Ingham and other magistrates, who did their utmost to dissuade them against proceeding farther ; but without avail. Mr. Ingham then rode on to Burnley to obtain the assistance of the military. Meanwhile, a perfect panic existed in Skipton. Business was entirely suspended ; shops were shut, the windows of the private houses were closed or the blinds drawn, and the doors in many cases securely fastened. While a portion of the mob at once visited the mill of Mr. Dewhurst, the remainder went round the town, levying black-mail everywhere. They entered shops and houses, and without resistance carried away the provisions that first met their eyes. In a multitude of instances the householders had provided food against their coming, knowing this to be one of their demands. Where remonstrance was ventured, the only reply given by the plug-drawers was that they had “done as long as they well could, so now they were like to take off t’ lump ! ” — an expression about which there could be no misunderstanding. The local magistrates had not been, heedless of the expected visit. Mr. M. Wilson, sen., Mr. Cooper Preston, Mr. J. Garforth (all deceased), and Mr. M. Wilson, jun. (now Sir Mathew) were soon busy swearing men in as special constables, pending the arrival of the military. On visiting Mr. Dewhurst’s mill, the water was let off from the boiler by the mob, and work was stopped. Mr. W. Sidgwick’s (Low) mill was next treated in the same manner, and at the High Mill the plugs were drawn from the boilers, the fires were raked out, and a peremptory order was given that the workmen should be turned away. Here money was demanded of Mr. John Sidgwick, as a condition of the withdrawal of the mob, and was given. The rioters then left; but with the threat that if the mill was worked without their consent they would return and do mischief. The violence of the plug-drawers was such that at last the magistrates had the Riot Act read in the market-place, and the mob soon afterwards were persuaded to withdraw from the town. They halted in a field known as Annahills, by the side of the road to Carleton. Here again the Riot Act was read. The military was now announced as at hand, and soon a portion of the 61st regiment of infantry, under Captain Jones, appeared upon the scene. Having reached the camping place of the rioters, the soldiers were ordered to charge the mob, and they drove them into the adjoining road, whence were thrown volleys of stones in reprisal. One soldier was so severely injured that he died shortly afterwards. Mr. Garforth, the magistrate, also received in the same manner injury to one of his eyes so serious that he was unable afterwards to see with it. But the defence of the rioters was brief, for no sooner did the military prepare to follow them into the lane than they took to their heels as for very life, and clambering over wall and hedge dispersed in all directions. Not a single shot was fired by the soldiers. This bloodless struggle obtained the name — by which it is yet known — of “Annahills Fight.” The good folk of Skipton now breathed more freely; but it was a long time before the town regained its normal quiet. A contemporary newspaper had the following despatch from Skipton eleven days after the riot : — “This town has remained perfectly tranquil since the outrage of Tuesday, immediately after which the magistrates present, consisting of M. Wilson, M. Wilson, jun., T. Hastings Ingham, and C. Preston, Esqrs., had a conference with the mill-owners, and pledged themselves to protect them by the presence of the military if they would immediately commence rimning their mills. This was instantly acted upon, and we believe every workman in the town returned to his work. Some of the above magistrates have remained in the town day and night during the last week. In consequence of the disturbed state of Colne, Captain Jones, of the Gist regiment, was ordered back to that town, and thus Skipton was left without military protection. The magistrates being determined to keep the mills running, applied to Major-General Brotherton for troops, and we are glad to say that a company of the 73rd regiment, under the command of Captain Widdington, marched into the town as early as seven o’clock on Tuesday morning, and took possession of most comfortable barracks in the fine old castle of the Earl of Thanet. An example of energy has been shown by the magistrates and inhabitants of Skipton, which, if it had been acted upon in other places, we are sure the course of these mischievous people would have been sooner checked. Measures are still in progress which it is hoped will ere long lead to the 0apprehension of more of the ringleaders in these riotous proceedings.” We can only guess how the Rileys reacted to this. In the following weeks, the younger elements in Skipton saw an opportunity.“It may be noted that soon after the Plug-drawing Riot a farcical imitation took place. About thirty or forty mischievous young men of Skipton banded themselves together, and went as far as Linton and Grassington, terrifying the simple country-folk, who, glad to get off so easily, supplied them with bread and beer from the upper windows, and in some cases with money. Other of the farmers, of a more practical turn, presented their loaded guns, and were thus unmolested. Public-houses were visited, and the mob helped themselves to the best. The terror they occasioned was the greater since they took care to assure every household they entered that additional operatives were coming from Skipton. News of the affair reached Skipton, however, and a handful of men — special constables — hastened after the imposters, who at sight of them fled in all directions.” As a family man, it is unlikely that William Riley joined in this. Despite the unrest in Burnley, the family moved there. By 1851 they were living in White Lion Street. 1851 Census. Parish of Whalley. Ecclesiastical District St Peter. Town of Burnley. Ann died the following year. She was buried at St Peter, Burnley, on 8 Feb 1852, aged 39. Her address was White Lion St.
We do not know what happened to William after that. He has not been found in the 1861 and 1871 censuses, nor has his burial been found in Burnley. BMD and censuses from Findmypast.